December 9, 2015 – A change of government often implies taking a step back and a fresh start with advocacy files at hand. In the case of R105 withholding, the Performing Arts Tax Working Group has taken advantage of the situation to strengthen its case and to expand its efforts to all aspects of non-resident taxation. In 2014-2015, Arts Commons presented 13 foreign acts, each one triggering a complex non-resident taxation process. 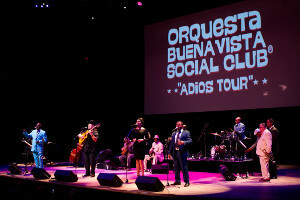 Photo: Orquesta Buena Vista Social Club at Arts Commons. Credit: David Kenney. As reported in September, there have been a number of cases in the last year where non-resident artists and companies were assessed penalties for failure to file a information or tax returns. The situation was discussed at length during a workshop held at the CAPACOA Conference and stories emerged confirming the impact of these penalties on presenters: in one case a performance was cancelled after a non-resident company found out it owed the Canada Revenue Agency a penalty for non-compliance; in other cases presenters were contacted by the Canada Revenue Agency and were asked to deduct penalties from fees to non-resident artists. Exclusions for artists in tax treaties. While the administration of tax legislation and tax treaties is the responsibility of the Canada Revenue Agency, the legislation and the treaties themselves are the responsibility of the department of Finance Canada. Consequently, the Working Group sent distinct letters to the Minister of National Revenue and to the Minister of Finance, addressing the different recommendations. "We believe the situation has reached a point where taxation of non-residents is creating systemic barriers to cultural exchanges between Canada and other countries ... considering your government’s intention to reinvest in cultural diplomacy, through the Canada Council for the Arts and through a dedicated program in replacement of PromArts and Trade Routes, we felt the urge to bring the issues of non-resident taxation and our recommendations to your attention." Some of the Working Group's recommendations refer to Legislative Proposals that could be part of the 2016 budget. Therefore, we are hopeful that the government will respond promptly to this correspondence.